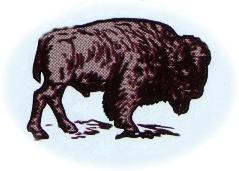 The town of Buffalo, located at the western boundary of the Cherokee Outlet and near the eastern edge of the Oklahoma panhandle, is full of history of statehood and the Indian Territory. The townsite was staked out in the valley of the Buffalo Creek from which it received its name, and lies along the old Fort Dodge - Fort Supply Military trail. The Great Western Cattle Trail had a main water stop near Buffalo at Doby Springs, which was then known as the Buffalo Springs. Surrounded by red earth, deep canyons, and cultivated fields, it presents a wide vista of scenery to travelers and residents alike. Buffalo's Post Office was established on May 18, 1907, about 5 months before statehood. Brule, located about 3/4 of a mile north of present downtown Buffalo was the first Post Office established in 1899, but it ceased to exist at statehood when Buffalo became the county seat. Buffalo was nicknamed the "Stone City" because no buildings were permitted in the business district except of "fireproof" construction due to the common prairie fires. Because of this ordinance, many of those buildings are still standing and in use today. Buffalo's progressive people continue to build with a public and private museum, lodging, restaurants, parks, recreation sites, an antique mall, and unique shops. This community of 1200 proves it's pioneer spirit is alive and kicking in northwest Oklahoma. Wacky Wacky Wilsons Roadside Museum and Themed Wedding Chapel - A very unique experience. Doby Springs Park and campground is complete with a fishing pond, nature trails, picnic areas, and playground equipment for the children. The park also has 18 camper sites with electricity and a dump station. A very nice nine hole golf course is located adjacent to the park.